This is old and outdated! New hood pictures here! As the warning states, this is a work-in-progress. I always enjoy looking at maps and neighborhood photos on other blogs, and thought I should put up the same in case anyone was curious about Millwood and South Port. The tiny town of Millwood, it rests at a higher altitude than South Port, and is home to roughly twenty houses, and only a handful of small businesses. Welcome to Millwood sign and the only bus stop in the town. Many of the residents call Englewood Avenue their home, including the Millett, Russo, and Creelman families. 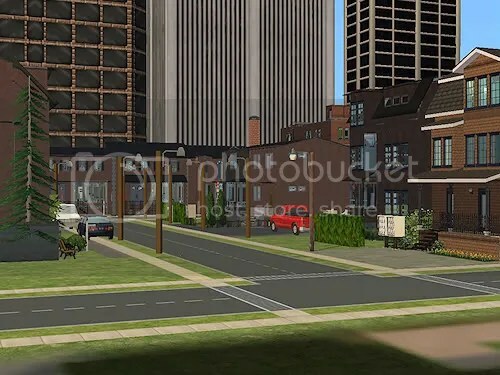 South Port offers a variety of housing options within the city limits, this particular corner is perfect for those starting out with apartment living, as well as families that want their own land (albeit small) with a little house on top of it. Close corridors and not too expensive to live in this area. Community living on Red Fox Boulevard. Hathaway Street with more apartments. Division Street, has houses both townhouse and traditional. The lots are small and the homes take up most of the land. It’s not odd to wave at your neighbors from your kitchen window while they are watching tv next door. Perks, always kids to play with, a good school system that is near by, and the ability to walk just about anywhere downtown. South Port’s Main Square, flowers, benches, and a main bus stop. The Mayor Walter Steele rebuilt the railway in South Port to cater to tourists, and cruise lines alike, including a scenic route that meanders into northern territory. Millwood has such a quaint, cosy feel to it, and South Port looks really great. I love the bit about waving to your neighbor out the kitchen window! 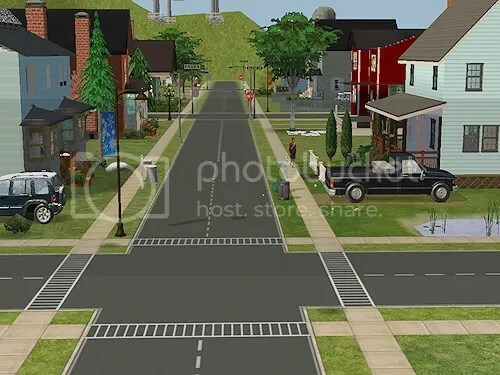 I always thought that was one of the main things lacking in the Sims 2 neighborhoods that shipped with the game–all the houses were so far apart and way back on big lots. Agreed! I hated how huge the lots were, and how far apart neighbors were. If it weren’t for the mini lots made, it’d be difficult to have a truly awesome downtown. It looks so wonderful! I’m terrible when it comes to decorating the neighborhood so I’m always in awe when I see other people’s hoods. It looks like a real town. 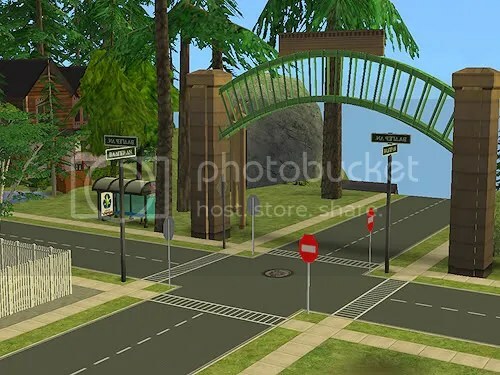 I like all the little details like the bus stops and the street signs etc. Where did you get the statue in the town square? Another question for you…..the picture that follows Division Street that states it houses townhomes and traditional homes…..how do you achieve that look? What lot sizes did you use? Nita, I’m pretty sure the statue comes with one of the expansion packs, cause I didn’t download it. Maybe you’ve just overlooked it in the past. The houses there are from plasticbox at MTS. here, here, and here. 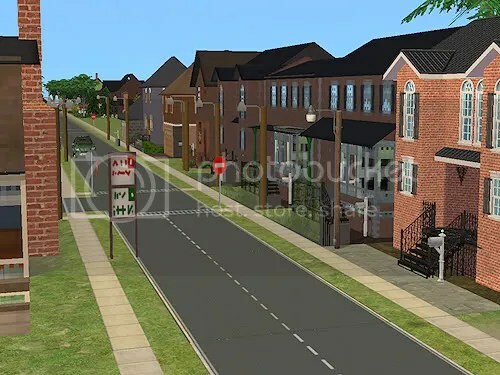 I also built some fake rowhouses, and you can download them here if you wish. It’s wonderful! 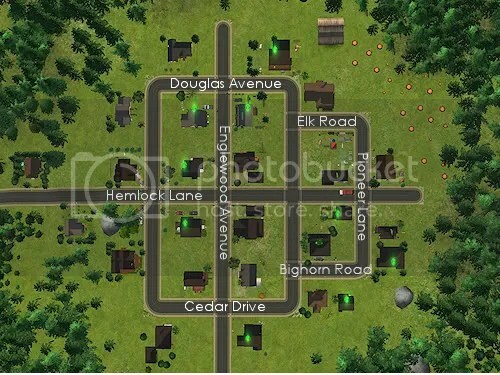 Did you make the neighborhood template? Thanks Julie! 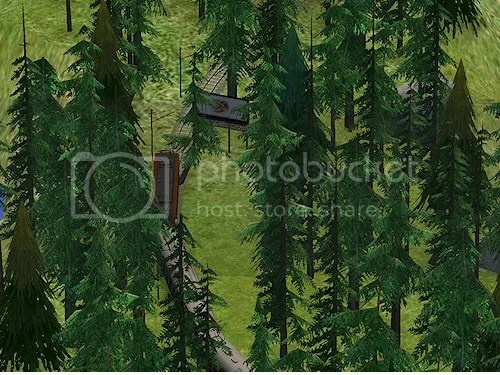 This terrain was actually modified from a downloaded one. I’m uncertain where I downloaded it from, it’s been more than a year since I originally got it. I’m no longer using it ether, I split the towns up (south port and millwood), so that I could use all the deco I wanted and not cause crashing/delays with my camera. 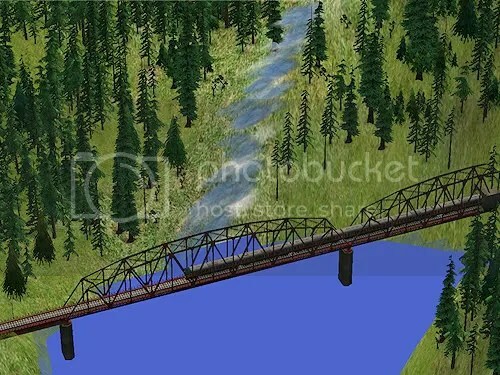 My new ones I actually made with Sim City, bought the game for that specific purpose actually.